UNLEAVENED BREAD is the feast that falls on the day after Passover, and is to memorialize what Yah did for our redemption by sacrificing His Son for us. Seven days of unleavened bread—this symbolizes, by forsaking the acts of sin, a memorial to Christ for offering Himself for us. The bread is a symbol of the body, and it is sinlessness that will be given to us when our bodies are redeemed. Christ's perfect physical death brings forth perfect spiritual fruit. This feast was fulfilled by Christ's sinless body being entombed in the ground. FIRSTFRUITS is day the High Priest brought the sheaf of barley for a wave offering to Yah, as it signaled the first day of the barley harvest (barley is a biblical symbol of the bride). On the week of Passover, the High Priest went out and chose a ripe barley field to be offered to Yah as the Firstfruits offering. Christ did the same thing after His resurrection with the souls that were raised up with Him. He presented them as the true Firstfruits of the Resurrection, which was the fulfillment of this feast. WEEKS (Pentecost) is a feast that is actually started with Firstfruits; it comes at the end of the “Counting of the Omer.” The High Priest went to the field that he chose for Firstfruits and removed a sheaf of barley every day for seven weeks. He presented the sheaf to Yah as part of the Firstfruits. The forty-ninth day, the last day of Omer, is when the High Priest brought in the remaining sheaves of the barley field to be presented to Yah. The fiftieth day is the Feast of Weeks, and it commemorated the day that Yah gave Moses the Ten Commandments. This was when Moses presented the symbol of the Covenant of Yah to His children. This feast was fulfilled by Christ sending the true Covenant of Yah, His very own Spirit, to seal the soul with a perfect seal of a perfect covenant for a perfect eternal life. The fiftieth day begins the second harvest, the wheat harvest. The wheat harvest is also part of the Feast of Firstfruits. There are two harvests of two different fruits. Both seeds are sown at the same time in the autumn, but barley matures first and seven weeks later, wheat matures (we will see the significance of the two harvests later). TRUMPETS is the feast that the Jews called “the day or hour no man knows” because it is the only feast that is determined by the first sighting of the new moon by two independent witnesses. On the new moon of the month of Nisan (Passover month) the high priest had the trumpet blown to start the feast season. This was the First Trump, and for every new moon for the next six months the trumpet was blown. The new moon on the seventh month,"Tishri," is called the Last Trump (1 Corinthians 15:52) and the trumpet was blown 100 Times to begin the judgment feasts, and Trumpets is the first judgment. Yah judges His house first (1 Peter 4:17). Jewish tradition teaches that those who have the Covenant of Yah will present it to Him at that feast (Revelation 4:10) after the “come up here” statement in Revelation 4:1, the presenting of the crowns. The Feast of Trumpets is also known as The Feast of the Shout, when the high priest shouted that the new moon had been seen, and ordered that the trumpets be blown (1 Thessalonians 4:14-17). 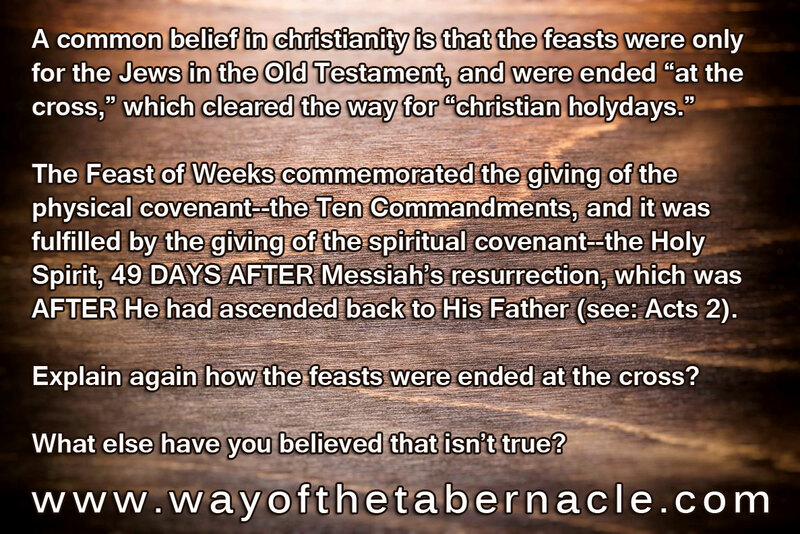 The feast is also known as the Wedding of the Messiah. To have a wedding, there must be a bride, and the Feast of Trumpets is when Messiah's bride will be raptured. The Feast of Trumpets is when the coronation of a new King is done (Revelation 5:5-9). This is when Christ receives His authority over the earth. The Feast of Trumpets is the next feast to be fulfilled on Yah's prophetic calendar. ATONEMENT is the feast during which a scapegoat was released into the wilderness with the sin of all Israel. A white fleece was dipped in blood and hung on the post of entrance to the temple. The people waited to see if Yah had accepted their offering for atonement by changing the crimson fleece back to white. Yah would do this when the scapegoat died with all of Israel’s sin upon him. The Feast of Trumpets begins the Ten Days of Awe that leads into Atonement. The ten days are for fasting and suffering, to be chaste in preparation for atonement. The Feast of Atonement will be fulfilled at the end of the Great Tribulation by Christ separating the sheep from the goats (Matthew 25:31-46). 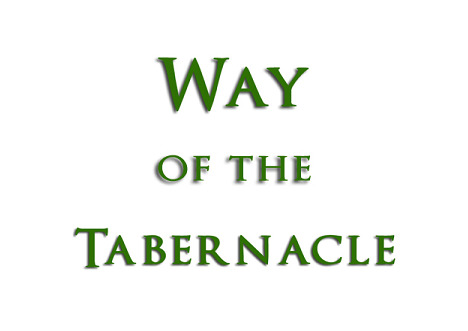 TABERNACLES is the third and last of the judgment feasts. It is a seven-day feast plus an eighth day of “new beginning.” This feast was used to dedicate the temple to Yah by burning anointing oil in the menorah for eight days. The first day of the feast was the day Christ was born, and on the eighth day he was circumcised to be dedicated to Yah, as the first born son that breaks the womb of a woman was to be dedicated to Yah. Tabernacles is also called the Feast of Booths. The men of Israel were to live in tents for the seven day period. On the eighth day, they would all come into the temple in Jerusalem for the celebration of a new beginning of life. Yah reveals that man will live in a temporary dwelling place (the body) for seven thousand years. Then, on the eighth day, he is brought into the New Jerusalem for new beginning of life eternal with Him. This is seen in Revelation chapters 21 and 22. Christ's bride will be revealed to all of creation as the Queen of Heaven and Earth to rule with Christ for eternity. While the traditions that have been created by men, and have supplanted the true traditions of Christ, are filled with many emotion-driven thoughts and ideas, the real things of Yah—the days He desires His children to observe as a “sign” between them and Him forever, are truly rich in symbolism and meaning. And, since the perfection (details) of the law was nailed to the tree (Colossians 2:14), we are free to observe/teach them however we desire. Often, Colossians 2:16-17 is used as a defense for the observance of man-made traditions and holydays, but Paul is clear that he is describing these feast days, as he states in verse 17 that they are a shadow of things to come, and the man-made traditions are not. 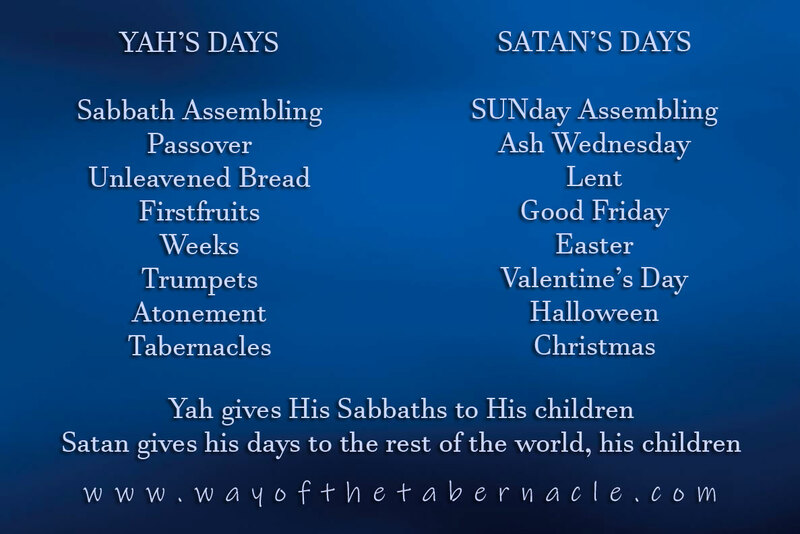 Only Yah's prophetic Sabbaths are shadows of things to come. So, again, while believers are free to observe and teach the feast days in whatever manner they choose, it IS the Father's will that His children do so. Excerpted from "From Christian to Believer."